Here at Citylink, we associate brunch with good times, relaxed days and just watching the world go by with little or no care in the world. With Galway brunch options on an upward curve all the time, we decided to put together a list of some of the most exciting places to stuff your faces. This is by no means a definitive list of the best places in Galway, but instead some of our favourites, and a few of the places you simply have to try over the next few weekends. Get drooling! They also do a delicious full Irish or a breakfast wrap and they are not overawed at even the most peculiar requests. Pancakes with a side order of hash browns and a large quarter pounder too? Grand. Right in the heart of town, exquisite coffee and always renowned delicious food. Think French croissants or banana buttermilk pancakes that could easily fix the worst hangover in the world and a cupboard full of cakes to digest. Get in my belly. DJs & Cocktails combine to unveil Galway’s newest brunch place which we must say pretty damn cool. There’s a gigantic anatomical drawing of a heart in the hallway, there’s all types of paleo delights on the menu whilst the barista urge you the customer to take on the increasingly popular Darth Vader coffee. 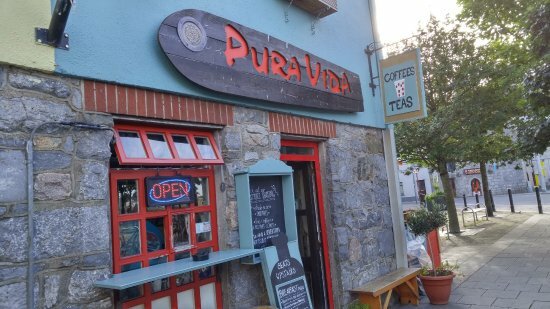 A perk of Pura Vida is the outdoor seating area with a view over the Spanish Arch. It’s such a novelty to sit outdoors in Galway and enjoy a full Irish or a full veggie breakfast as you bake in the sun! It’s not the biggest cafe in the world: downstairs there is room for approximately three people to be seated on a wet & dreary afternoon, while upstairs has four or five tables that can facilitate a large group, and couple of window seats. It is a fantastic spot for watching folks pass on by. One of the more popular locations for brunch in City. This menu is constantly re-inventing itself, changing daily from pure inspiration. You can be exceptionally lucky with the food there, or just regular lucky. Seaweed shakes, an epic full Irish or the best combination of anything ever: smashed avocado with bacon. The Gaslight Bar & Brasserie has swiftly become one of the most talked-about casual dining restaurants in Galway and is located at the steps of Eyre Square, an ideal place for brunch in Galway City. The menu will cure what ails you with a wide selection of satisfying sandwiches, crunchy bruschetta, fabulous fish, serious steaks and seasonal specials. The Oyster Bar close bar this experience is sure to quench your thirst and leave you satisfied. Well those are six places to brunch in Galway, if you have any you think need to be added to our list. Get in touch with the guys in Citylink. We’re always on the lookout for new places to brunch!